Being a manager, who tells people what do, is something completely different then being a leader, who asks and listens! Great business leaders foster an ‘inclusive’ environment in which everyone’s opinion counts, and in which everyone gets the possibility to learn. In many ways this resembles how parents raise their children, by respecting, coaching and stimulating them. And the good news is, this can spread like an infection through your organisation, in the end resulting in more satisfied customers and better business results! This is the main message of Lee Cockerell, in his book Creating Magic. 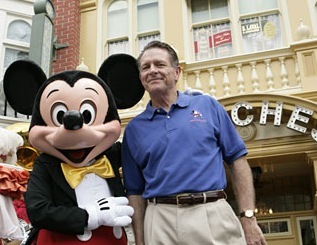 As executive vice-president, he was responsible for all operations at the Disney World Resort during the period 1997-2006. What can we learn from Cockerell? A lot! Which manager doesn’t want to know how to create the environment in which everyone wishes to work, and which attracts customers in magical way? Lee Cockerell (see the picture on the left) received several awards for outstanding leadership. But above all, he is known for his creation of the Disney Great Leader Strategies. These guidelines still serve as the primary resource for developing all leaders at Disney. In addition, they form the core of the management training programs at the Disney Institute. In his new book “Creating Magic”, Cockerell explains how he came to his ideas. In addition, concepts such as pre-shift meetings (like in TPM) and standardizing working processes and adapting them after finding the root cause of possible problems are applied (like in Six Sigma). However, let me emphasize once again that none of this Lean or Six Sigma stuff is discussed in this book. How can you create an “inclusive” environment in which everyone feels his or her contribution is appreciated, so that everyone will start to look for ways to perform better, and does not hesitate (or is afraid) to suggest process improvements. Both the customers of Disney, the Guests, and the employees, the Cast Members, are deliberately written with a capital letter in the book. That way, Cockerell wants to teach us that putting the Customer first, begins by treating your Employees with as much care and respect as possible. His business formula is simple: Committed, responsible and inspiring leaders create a culture of care. This will lead to services and products of high quality, to satisfied customers, and finally to ‘magic’ business results! Treat me like an individual. Be professional (to a customer) or Make me professional (for an employee). Exceeding customers’ expectations so that their experience becomes magical (so that these people in the end become a Net Product Promoter, as Philips would say) is done within Disney by adding small, well thought-out and customer-specific services: Be so kind to your customers, that they don’t believe it ! Cockerell is entitled to speak: The company he managed so successfully is huge. The World Disney Resort in Orlando (Florida) is about the same size as San Francisco, and is the biggest tourist attraction and one of the biggest congress centers in the world. It has 32 hotels and four big theme parks, connected by roads with a total length of 267 kilometers. With 59.000 Cast Members it is the biggest employer at one place in the world. 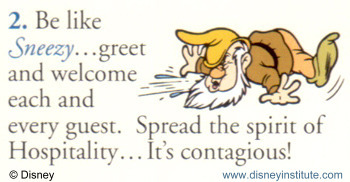 The subtitle of Cockerell’s Book is “10 Common Sense Leadership Strategies from a Life at Disney”. In my opinion, Cockerell is to modest with this. What he means is: A lot of his strategies are familiar, and are even practiced in daily life by parents raising their children. However, there are not a lot companies applying these “common sense” rules. Therefore, a better subtitle might have been “10 overlooked common sense Leadership Strategies”. + This book addresses the often encountered problem of how to get committed and emotionally involved people, who all continuously strive for perfection. + Cockerell’s principles about being a good leader seem to be applicable in all business sectors. Focus is however on how to stimulate involvement of people to improve existing business processes. The book is not only inspiring, it is also written with warmth. Cockerell sounds like someone you wished you had as a friend when you started your business. However, he admits that he has not always been this way. On the contrary, in the beginning of his carrier people saw him as a manager showing no mercy! During his life he became convinced that this was a bad strategy, because it made people afraid to approach him to tell about problems in the working place. Lee’s story is about a manager who changed his approach from ‘telling’ (do what I tell you or leave! ), to ‘asking’ (what do you need to do your job better’), and ‘listening’ (to problems people might have and to the voice of customers, who are not always fully satisfied). This is not a ‘soft’ approach, it simply gives better business results!. The reorganization of Disney from top-down to ‘democratric’, which was accompanied with the formulation of the Disney Leader Strategies, started in the early 90’s. There was a clear business-case for doing that: The switch was based on the finding that company parts with the highest ratings in customer satisfaction, were lead by managers that were rated best in listening, coaching, and giving recognition and decision-making authority to their people. In my personal opinion similar characteristics explain why Toyota is so successful with Lean, where many other companies fail. Therefore, Cockerell's book is not only of interest to people working in the service industry, but to people in any sector. He himself points out that products and services can be copied easily, whereas quality and high service cannot. Cockerell starts his book with the following sentence: “I am grateful to the following people for their contributions to this book and to my life. Everyone Counts, and I want that everyone knows that he or she counts”. This points ahead to his first and most important leadership strategy: Inclusion. The reason why this is so important: If everyone knows that he or she counts, they will come to their work with pleasure, and they are willing to invest all their energy and creativity! This is ‘common sense’ indeed: Everyone wants to feel included, respected and heard!. When raising children, it is important that they feel they are special, and a parent can give them that feeling by knowing them well. This is no different with employees. Like a parent, you should be available day and night when your people need you. People who are cleaning the toilets are just as important as their managers and CEO’s, says Cockerell. In addition, he stresses the need to take the practical knowledge of everyone seriously: Ask them for advice, and let them know you are open for suggestions. ‘How many times have you heard leaders say, after a crisis, why didn’t anyone tell me that?. Probably this is simply because they didn’t dare!’. Cockerell gives in his book 13 tips to create an inclusive environment. When a reader studies these well, he or she will almost certain find things to improve personally, not only as a manager but also in daily life. For me personally, ‘listen to understand’ was a real eye-opener. Like many other people I do not focus completely on the person I have a conversation with, but instead I am also busy formulating my reply or - as a journalist - thinking about what my next question will be! After the chapter about ‘inclusion’ of people, nine other chapters follow, which all address one of the ten Leader Strategies of Cockerell (see the box below). Break the mold: This strategy is about creating a horizontal (flat) business organization, in which every individual clearly understands what he or she is responsible for, and how he or she will be held accountable. Make people your brand: select the right people for the right roles. Eliminate Problems, and implement effective and structured processes to get the work done. When there is a problem, don’t ask ‘who’ (did this) but ‘what’ (caused this). Discover the truth, by visiting the working floor. Use the free fuel, which is generated by applying ARE: Appreciation, Recognition and Encouragement of your employees. Walk ahead of the troops. Don’t stop learning, read and read even more. Visit the best companies in your business sector, and stay in contact with your (ex-)colleagues. Be careful with what you say and do, because everyone (in your company) is watching and judging you. When you are at work, you are OnStage! Develop Character. What are your values, where do you draw the line? The book is inspiring and well-written. Of course, there are also a few minuses. Problems, like people who are simply not willing to give their full commitment or who will make abuse of you ‘being available all the time’, are rarely discussed. Some readers might therefore think ‘Isn’t this all an American dream?. This thought is a bit provoked by some methods which are mentioned to show that you appreciate your people, for example by organizing a monthly ‘Prize Patrol’ through the company. This might work in America, but probably not in Europe. It would however be a pity if someone wouldn’t take the message of Cockerell seriously because of that. I think he clearly shows how to make maximum profit with a good product, in this case the magical world created by Disney. Cockerell is an ambassador of time management. In the chapter ‘making people your brand’ he stresses that he finds it very important that people are very organized, and that the people he hired were always like that. No one will deny that it is very important to behave in a structured way in service industry. But what about people who should develop new products or should invent ‘breakthrough’ business processes? Personally I don’t think these very creative people would have been hired by Cockerell, because these persons are often to chaotic. What about the people who think up the new adventures of Disney's Donald Duck, which I read with so much pleasure every week? Would these people be great time managers? And what about Google, a company which is more or less driven by creative people?